I always forget how good smoothies are so when I finally do get around to making one I kick myself for not making them more often. The hardest part of making the smoothie is cleaning the blender when you’re done. And, really, that’s not so bad. This version was made with yogurt but you can also substitute a scoop of ice cream or frozen yogurt instead. Alternatively, you can throw some orange juice into the mix – the result is a little more “juicy” than “smoothie” but it’s still the same concept. * My blender doesn’t like large chunks of ice so I try to throw smaller pieces in. If you have large ice cubes, you might want to throw them into a bag and crush them with a hammer (or blunt instrument of your choice)before putting in the blender. Alternatively, you can fill an ice tray with only a little bit of water so that the resulting cubes are smaller. I scrubbed two sweet potatoes, poked them a few times with a fork. Set them in the microwave for about 6 to 8 minutes. I then heated up the chili in the microwave. Meanwhile, I sliced open the potatoes. I used a fork to “mush up” the insides and pushed the potatoes to the sides of the skin to make room for the chili. 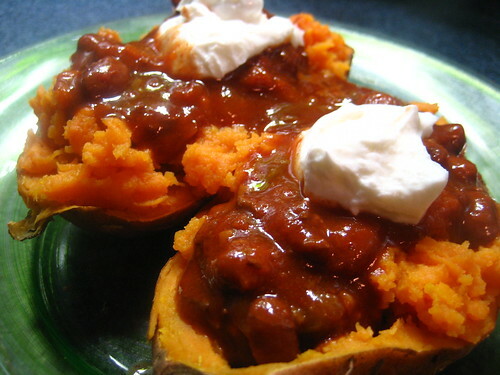 Once the chili was cooked, I spooned it inside the potatoes and added a little Greek yogurt on the top.